On May 15th, the Pujols Family Foundation wrapped up the spring sessions of Rattle and Roll: Children’s Music Therapy and Rhythm of Life Music Therapy. The purpose of these programs is to promote creative expression and social interaction through music for those with Down syndrome. As the final Rattle and Roll session started, children came running into the classroom smiling, greeting their friends and fellow classmates. As the music therapists began playing the “Hello Song,” the children and their parents sat in a circle and began singing and clapping their hands, following the same routine they had for the seven weeks prior. During the Rattle and Roll music therapy sessions, children were able to play with musical instruments like rice shakers and a large drum. The children were taught many fun songs throughout the eight week program. While some songs were meant to be silly and encourage the kids to participate, others had activities and lessons built into them. The children learned to take turns sharing various instruments, to making butterflies with scarves. Some songs were even taught with accompanying sign language. The children were sad to say good-bye for the last session of the spring, but left with new friends and songs to sing at home with their families. The final session of Rhythm of Life Music Therapy included a recap performance of all the genres and songs they had earned. This included artists like Lady Gaga, Elvis Presley, Elton John and more! 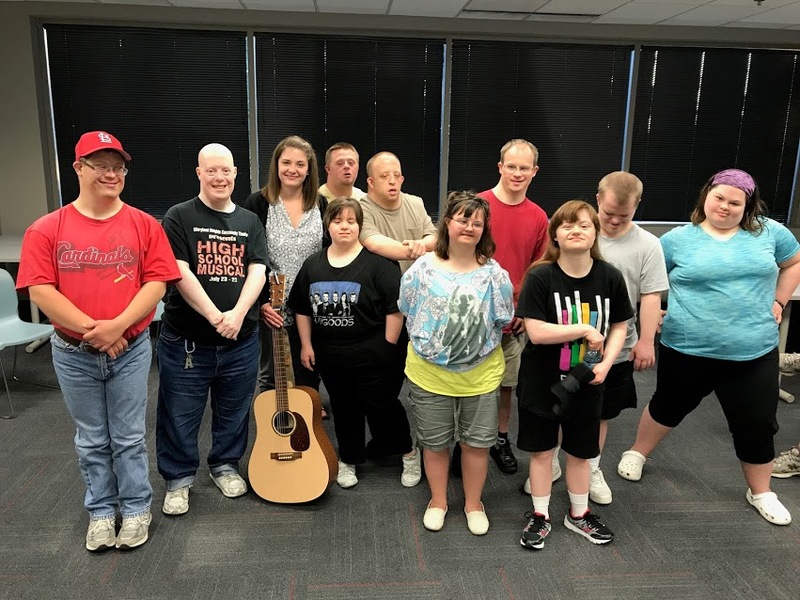 They were able to not only learn about the songs and artists, but also were able to connect and learn more about each other during the session as well. They talked about things that were going on in their lives, supported each other and learned together. It was fun to see the parents watch their children perform at the end, singing along to some of the favorites. Summer sessions of Rattle and Roll: Children’s Music Therapy and Rhythm of Life Music Therapy will begin in June at Maryville University. For more information, contact Jen Teemer at jen@pujolsfamilyfoundation.org. Thank you to Maryville University, the foundation families and everyone who helped to make the spring session a success!